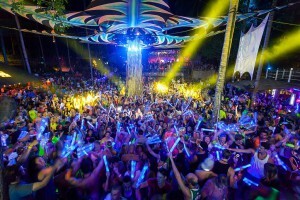 The Half Moon Festival is an off spring of the Full Moon Party, the event happens twice a month again related to the periods of the moon.The Half Moon festival is an outdoor club venue. The venue has a large DJ booth that over looks a dance floor surrounded by bars for drinks. A larger bar that faces the DJ booth on an upper level also has a dance floor, with tables and chairs for viewing the lower dance floor. All this located in the middle of a jungle creates an absolutely fantastic atmosphere. The event has an admission fee of 1000 Baht which includes a free Absolute Vodka bucket or two free drinks of your choice. A music CD is also included which you can download via there website. The venue attracts around 3000 people and is more organized and staffed with security. Half Moon Festival is Presented by “Harmony Team” who provide the highest quality sound equipment and professional DJ gear. The whole venue is decorated in UV decorations from Art Scape (Carin DIckson) and Live illuminated visuals projected on main screen. The lighting that covers all the dance floor and stage area are from Harmony Team. There are also professional fire dancers performing in different parts of the venue during the night. The music at the Half Moon Festival is a blend of Underground House and progressive Trance. The venue normally has a selection of local DJ’s , but over the past 6 months a few big named DJ’s have made appearances. 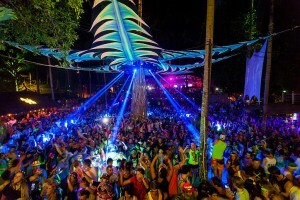 The party is getting more established and fast becoming a place you must visit like the Full Moon Party. The Half Moon Festival attracts some very serious party goers from all age groups, young to old, stylish and sophisticated. The event venue is located in the jungle of Ban Tai area. which looks to be a solid position for it now, as it has been held in other places including the beach of Ban Tai. The venue has a large car park and one entrance where you pay for your ticket. Once inside you start the walk up the hill towards the main dance floor, on the way you will pass two other smaller dance floors with there own DJ’s. The walk way up has various food stalls selling burgers, Turkish kebabs, Pizzas and various other breads. Taxis are running all night to and from the party, operating from all over the Island. Turn left at the 7/11 in Ban Tai, follow the road towards Thong Nai Pan for about 4km , you will not miss it!